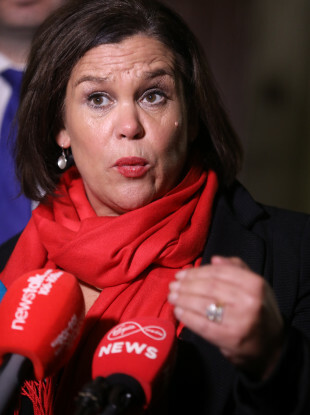 Sinn Féin leader Mary Lou McDonald. MARY LOU MCDONALD has said that the Brexit impasse is a “specifically English” issue and that the return of Stormont would not solve it. The Sinn Féin leader also said this afternoon that the Irish government must not blink in the face of “pressure tactics” from London. McDonald was speaking in the wake of the failure of the UK parliament to back Prime Minister Theresa May’s Brexit deal last week and the poor reaction from Europe to the proposals she made yesterday. “I think it is very concerning that Mrs May hasn’t removed the option of a no-deal from the table. I think that as each week passes, we come perilously closer to the prospect of a crash Brexit,” McDonald told reported. It is absolutely essential that cool heads prevail, that the government here doesn’t blink, irrespective of what pressure tactics or what overtures are made from London. McDonald also criticised the government’s planning for a no-deal Brexit, calling it “pretty threadbare”. McDonald was also asked whether having Stormont up and running, even temporarily, would be helpful in demonstrating opposition in Northern Ireland to the DUP’s Brexit position. McDonald said that while she supports a return of the executive, doing it without resolving the wider issues between her party and the DUP would not be helpful. “This is a much bigger political play that is in the first instance is specifically English, this is about English politics in the first instance and then British politics more generally,” she said. The moment we have a window, a real sustainable opportunity to get the institutions of government back up and working, I will seize it with both hands. I thought we had it last February. McDonald added that the backstop issue, which has proved to be the biggest stumbling block among Westminster MPs, was designed in part by the British government. “The backstop is already positioned as ’unless or until’, that’s hardwired into it. Bear in mind this Irish protocol of the backstop was very much crafted to the pallet of the British political system, they haven’t had this foisted on them. This is something that they have been very much involved in creating,” she said. We cannot have a hardening of the border, any undermining of the Good Friday Agreement, the rights of citizens in the north particularly need to be protected and upheld, those are the things that are absolutely sacrosanct. McDonald also said that British politicians have already been afforded reassurances from the EU that backstop will only come into force if no other arrangement can be made. Email “Mary Lou McDonald says Brexit impasse is a 'specifically English' political issue”. Feedback on “Mary Lou McDonald says Brexit impasse is a 'specifically English' political issue”.